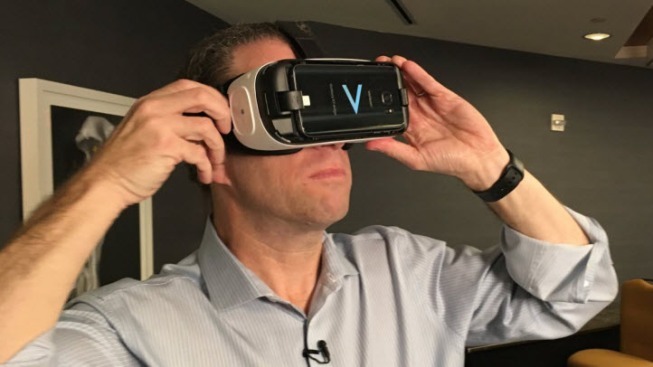 NBC Bay Area's Scott Budman watches "Thursday Night Football" on a virtual reality headset. I just watched football on a virtual reality headset. No offense to our network’s “Thursday Night Football,” but VR is super immersive, and it feels really cool to virtually stand on the field or walk around the stadium, without so much as leaving my desk chair. Virtual reality is still, for the most part, virtual. It's not quite ready for prime time commercial status, but still super cool. Intel recently bought Voke, which let me watch the game on its headset. It looks great. Voke’s David Aufhauser says the company wants to change how football fans experience the game. “You can feel like you're at the game,” Aufhauser says. “You can sit courtside if it’s a basketball game, on the field if it’s a football game, or I'm done, I want go to the owners' suite, and boom, you're in the owner's suite." We also visited a virtual pub and a virtual safari. All shot, for real, with numerous cameras. It’s all cool, and it’s all coming to a football fan near you.